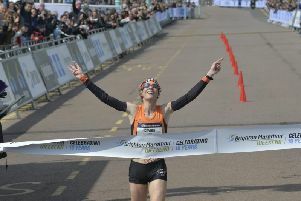 Marathon runners Louise Winter and Marc Bennett made a stop at Brighton Bandstand to tie the knot at this year's race. The pair met through running as members of EVO Running Club, and got engaged last year at their fifth Brighton Marathon – 100m from the finish line. So this year they decided to return to the annual event and get married along the 26.2-mile course. Brighton & Hove City Council‏ took to Twitter and said: "Congratulations to marathon runners Marc and Louise on their wedding day. "The happy couple said their vows on the bandstand at mile 25 before heading on to the finish line." The pair were running for Marie Curie, and the charity tweeted: "Good luck to all of our wonderful supporters taking part in the @BrightonMarathn today, and a huge congratulations to our #Brighton #Bride, Louise Winter, and her fiancée, Marc Bennett, who will be tying the knot at mile 25. Wishing you both a lifetime of love and happiness!"